The Battle of the Foot Strike: Is the Way You Run Hurting You? Your foot strike can have a big impact on your comfort and performance while running. Learn what yours says about your running style. Just like knowing your blood type, or the year your uncle was born, understanding your running foot strike might seem like a useless tidbit of knowledge. The term “foot strike” refers to how you land on your foot each time you take a step – and for decades the running community has intensely contested which strike pattern is the best. Why? Your foot strike significantly affects your speed, energy consumption, and even risk of injury every time you lace up those sneakers, so it stands to reason that athletes would be on the lookout for the optimal version of impact. With so many conflicting theories, it can be tough to determine which foot strike is best. Biomechanics—the study of the mechanical laws that govern the movement of living organisms (phew that was a mouthful)—can shed some light on this hot-button topic. You can’t argue with physics, and no matter how many running crazes come and go, science is always there to deliver some hard truths about the effects of exercise on the body. What are the Different Foot Strike Styles? Which Foot Strike is Most Efficient? How Does a Strike Pattern Effect My Probability of Getting Injured? Is There a “Bad” Type of Foot Strike? How Do Shoes Affect My Foot Strike? Before diving into the research, it’s important to note that each runner will have a unique strike pattern based on their weight, height, and bone structure. Even the foot strikes of pro athletes vary across the board. What does matter when examining your strike pattern? Deciding whether or not it’s putting you at risk for injury down the road. Let’s get to it. 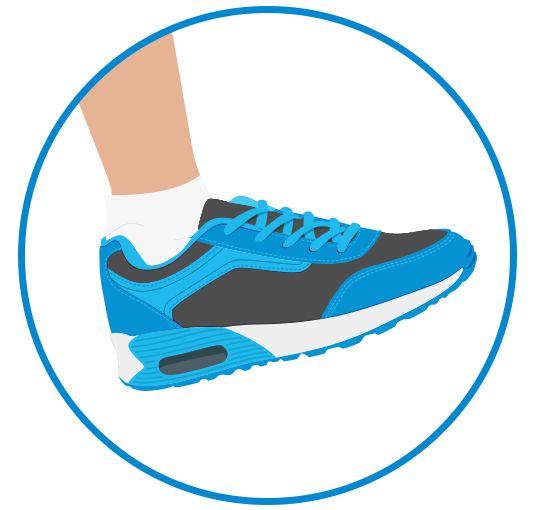 There are three different foot strikes – forefoot, midfoot, and rearfoot strikes. Let’s break them down a little further so you can figure out which category you fall under. Forefoot: This strike pattern places the weight of impact on your toes and ball of the foot, so your heels rarely hit the ground between steps. It’s likely that your upper body is bent forward in this foot strike position, and you might experience frequent cramps in your calves and around your Achilles tendon. However, a forefoot strike pattern can be great for powering you over a steep hill or giving you a leg up on the competition during a sprint. Midfoot: In this foot strike, the center of your foot lands on the pavement to evenly distribute the shock of impact. You should feel like your weight is balanced over your hips, knees, and ankles. With this pattern, you’ll probably notice you can maintain high, consistent speeds and have a higher running cadence than other athletes. Rearfoot: The most common foot strike amongst runners, the rearfoot or heel strike has you hitting the pavement with the back of your foot. Your stride reaches out in front of your body as you run instead of staying squarely underneath your hips. Beneficial for grounding yourself around a sharp turn or learning how to run quietly, the rearfoot strike can also act as a breaking mechanism for your body. Which Foot Strike is the Most Efficient? Whether you’re jogging around the block or trying to qualify for the Olympics, it’s never a bad idea to reassess the efficiency of your stride. But which foot strike is more efficient? Short answer: It depends. Let’s take a look at some of the research. One way that researchers measure running foot strike efficiency is by determining the metabolic cost for each of the three strike patterns. 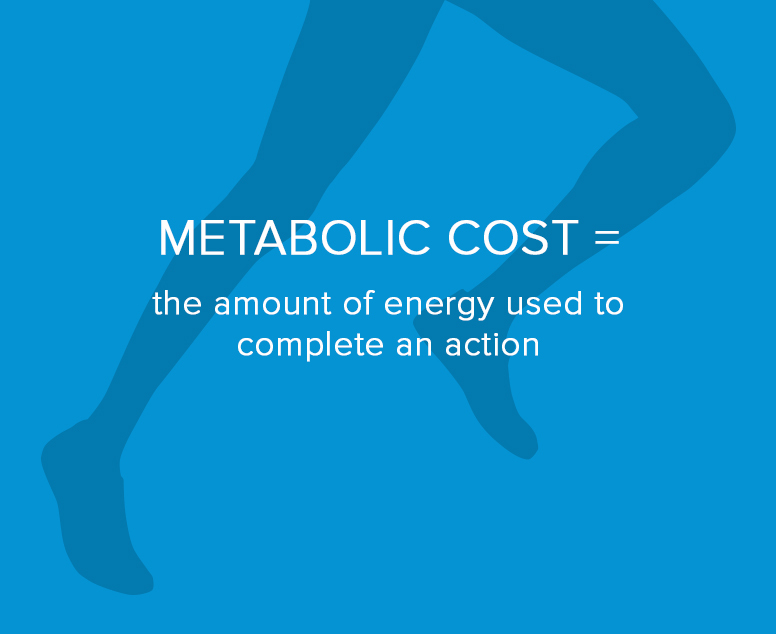 Metabolic cost = the amount of energy used to complete an action. A 2014 article from Podiatry Today pulled together all the studies that have been performed on energy efficiency to test the popular hypothesis that forefoot running is the best strike pattern. Research supported a different story than expected: the rearfoot strike pattern was found to be significantly more efficient on a metabolic level. And this is good news for a lot of us, as the vast majority of runners naturally use a rearfoot strike pattern. In fact, it turns out this foot strike is the least taxing on the body, in terms of both energy output and oxygen uptake. This research has widely debunked the popular barefoot running belief that the forefoot strike pattern is the most efficient. That being said, don’t run out and try to switch to a rearfoot strike. Why? Just because biomechanics indicate the rearfoot strike is better for many runners—at least on a metabolic level—doesn’t mean all runners should try to retrain their stride. Science indicates that the strike pattern you automatically fall into is almost always the most efficient. If you’re on the hunt for the perfect foot strike, it’s time to stop. You’ve had it along. How Does a Strike Pattern Affect My Probability of Getting Injured? When it comes to injury prevention, there are few different findings about strike patterns that runners with chronic pain should probably check out. Research published in 2017 in the Journal of Sport and Health Science concluded that altering your strike pattern can actually lead to increased injuries. Currently, the majority of studies indicate that there is no significant difference in the amount of injuries between runners with different strike patterns – but there is increased risk for runners who change their pattern. Because it works against your body’s natural mechanisms, shifting your running strike pattern can place added stress on your muscle tissue—tissue that may not have ever dealt with the rigors of your running regimen. Dr. Thomas Michaud explains that different strike patterns absorb shock in different areas of the body. Runners who have a rearfoot pattern experience the force of repeated impact primarily on their knees, not their ankles. Mid and forefoot strikers are the opposite; they absorb shock more prominently in their ankles instead of their knees. Switching to another strike pattern doesn’t help you absorb shock or prevent injuries, it merely relocates the force of impact to a different joint. Bottom line: Should you switch foot strike to prevent injury? 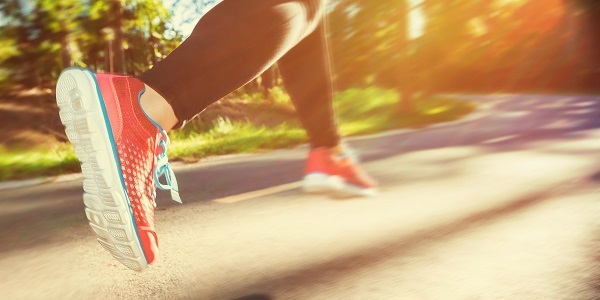 Podiatrists recommend switching from a rearfoot strike to a midfoot strike ONLY if you suffer from intense knee pain or other running-related injuries. There isn’t necessarily an incorrect foot strike, because as we mentioned earlier, it’s all dependent on the specific runner. In fact, many runners take advantage of all three strike patterns depending on the difficulty of terrain or desired speed. Let’s break it down even further. Think of choosing your foot strike like Goldilocks sampling the different bowls of porridge – one’s a little too hot, one’s a little too cold, and then there’s one that’s just right. Runners typically choose the correct strike pattern for the terrain currently in front of them—without ever consciously thinking about it. Our bodies are pretty wild like that. You’re bound to come across a slew of athletic “experts” and authoritative running websites that claim the midfoot strike is the healthiest and most effective pattern. Their argument rests on the idea that landing on the center of your foot reduces the strain on lower leg muscles to eliminate painful side effects such as shin splints and plantar fasciitis. But what does our good old friend Mr. Biomechanics say? Yep, you heard him right – that’s false advertising! With thousands of shoes out there on the market it can be hard to discern which pair of kicks is right for your foot strike style. Many minimalist running brands have been popularized by fans of the forefoot strike, while the traditional running sneaker with a cushioned heel is standard for mid and rearfoot strikers. Several studies have proven that a shoe’s design doesn’t necessarily induce a particular strike pattern. Once again, runners tend to self-select which strike style suits their needs and the immediate challenges they face on the course. 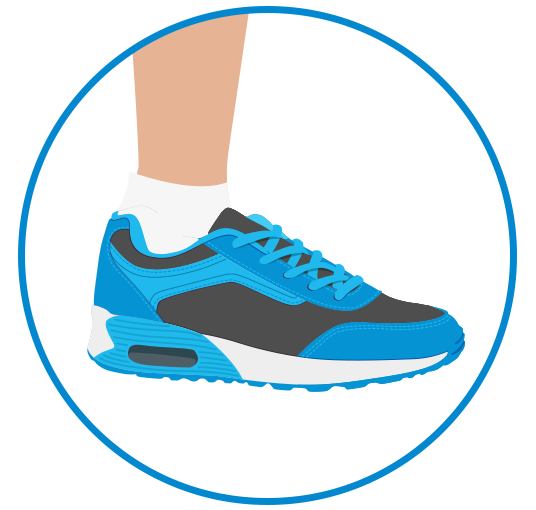 There is one aspect of running shoes that does have a significant impact on your foot strike: weight. 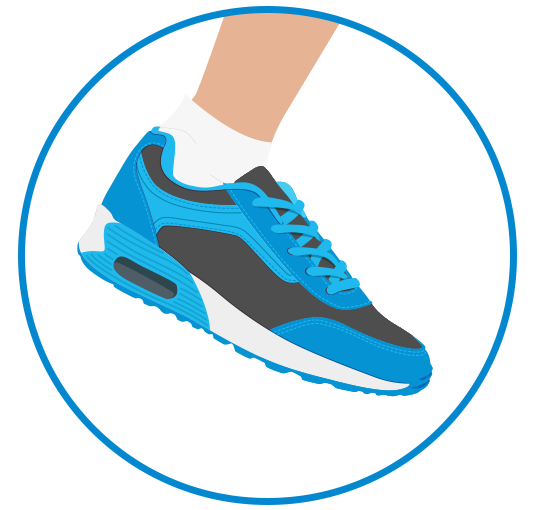 The heavier the shoe, the harder your body has to work to lift the feet, and the less efficient your energy use becomes. But don’t think that means minimalist shoes are automatically better because they’re lighter – there are plenty of sprint shoes out there that still include effective lab-tested cushioning. So when it comes down to the cold, hard biomechanics, the heated debate over foot strike styles seems completely unnecessary. 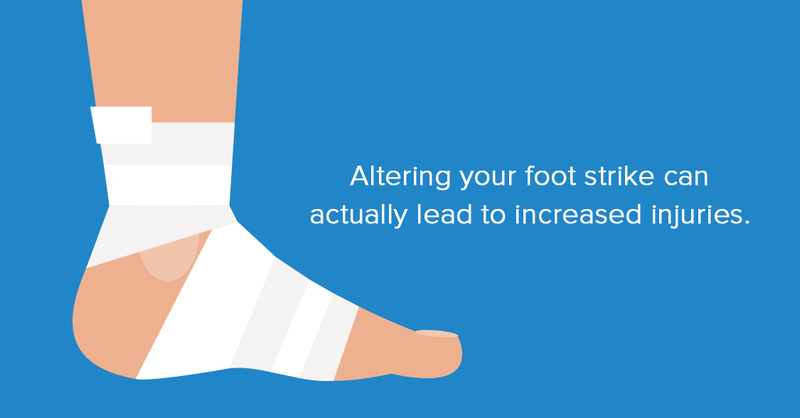 There are ways to ensure you’re getting the most bang for your buck from your foot strike. To make your foot strike the most efficient and ensure you’re less prone to injury, flexibility is crucial as well as strengthening key running muscles like your hips, quads and glutes. Unless you are an elite athlete or suffer from severe foot pain, there’s really no reason to change your strike pattern. Our bodies are extremely good at knowing what we need to do to stay healthy – it’s our brains that get in the way and mess it all up. HOKA ONE ONE Bondi 6 Review: Is This The World’s Most Cushioned Running Shoe?